Home to the Longest Zipline in Canada and the USA! Come and experience The Sasquatch® - the ultimate zipline. What more can we say? Spanning a mind-blowing distance of over 2 kms, you will take in spectacular views and over 7,000 feet of pure eco-exhilaration! Will you take it on? Ziptrek hosts a selection of breathtaking tours. There are 4 distinct zipline tours, and the TreeTrek canopy walk. Our wilderness area is located directly above Whistler Village, in the spectacular temperate rainforest valley between Whistler and Blackcomb Mountains. Choose from our 6 tour options, each offering an unforgettable experience. Perfect for those who are after the ultimate zipline experience! Perfect if you've ziplined before or crave an adrenaline rush! This is Ziptrek's original tour. Perfect for groups, families and first-time zippers! Perfect for those who have an enlarged appetite for adventure and exhilaration! Perfect for all ages with no ziplining required! Zipping in the late afternoon and early evening - The perfect après activity! Don’t just take our word for it. See the #ziptrek thrill first hand. "My wife, young daughter and I had an amazing, unforgettable experience. If you are in Whistler, this is a must for an adrenaline rush of all ages!!! The guides are friendly and safety is always paramount." "Understand Why Ziptrek is Rated #1"
"We did the Bear tour with Sean and Ben as our guides. Both were very friendly, very knowledgeable of the surrounding forest environment and very safety conscious. We were very impressed with the safety processes employed by the guides and the overall design of the equipment with safety in mind. And to top it off, it was great fun!" "THE SASQUATCH = MUST DO"
"Purchased the Sasquatch combo, which is really the only thing to do! Start off with the Sasquatch line which is 2 km long and can reach speeds well in excess of 100 km / hr. 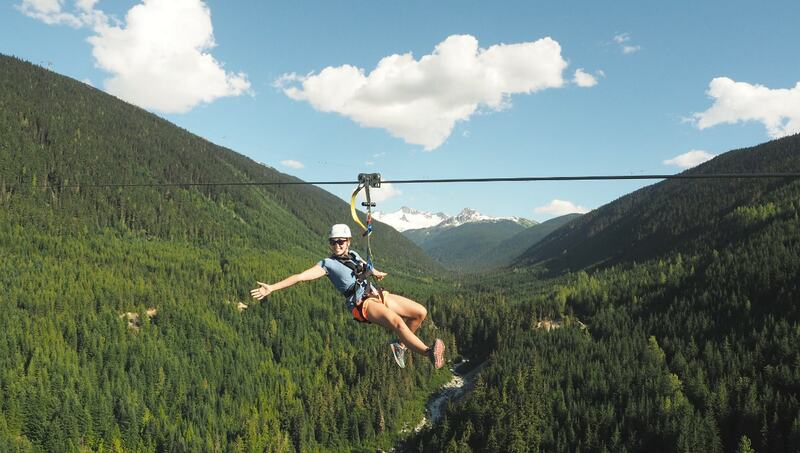 This is the longest zipline in North America. Can race alongside a friend as there is dual lines." "THIS IS THE PLACE TO ZIPLINE!" "We had a great time ziplining with Kate and Sam. We did the Eagle tour and were impressed with the views, sturdy platforms, and safety. Plus the guides were friendly and informative. This is a super fun thing to do!" "Awesome Time. Don't be scared, Just do it"
"We had a great time on the Sasquatch and Eagle Tours. It was my Dad's first time ziplining and he's in his 70s. Yes, Sasquatch is a little scary, but awesome. You'll regret it if you chicken out. Guides were superb.Loved all the eco information plaques on sustainability and the cool suspension bridges your get to walk across between zip lines. All in all, completely awesome experience :-)"
Sign up to receive emails about events & special offers. You can unsubscribe at any time by clicking the unsubscribe link at the bottom of our emails.